Doc. 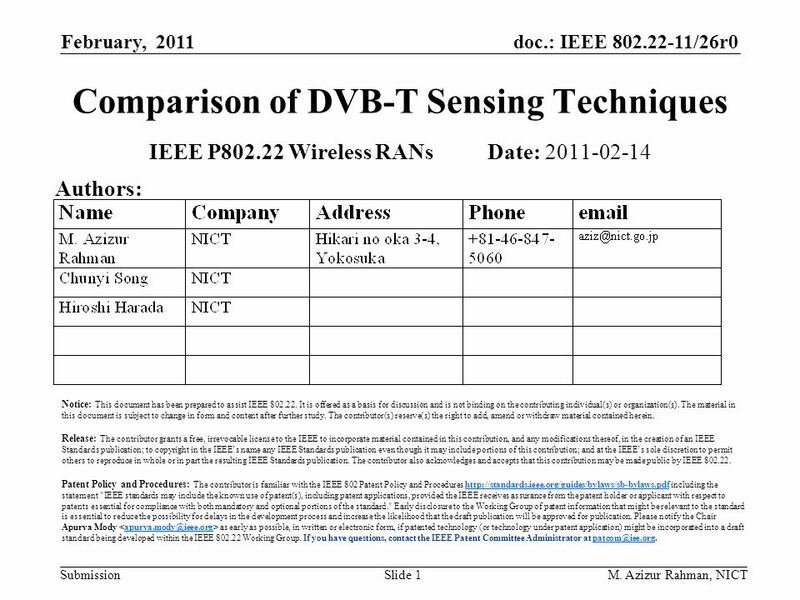 : IEEE 802.22-11/26r0 SubmissionSlide 1 Comparison of DVB-T Sensing Techniques IEEE P802.22 Wireless RANs Date: 2011-02-14 Authors: Notice: This document. 3 doc. 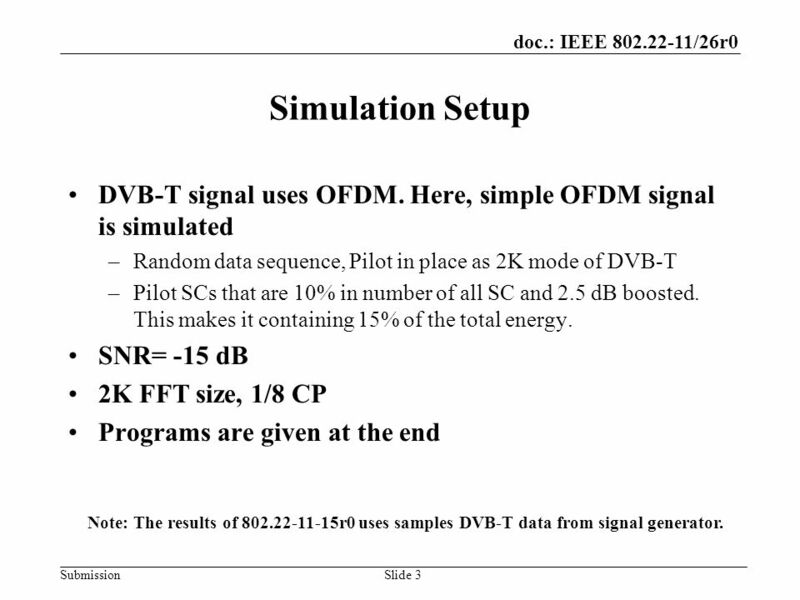 : IEEE 802.22-11/26r0 SubmissionSlide 3 Simulation Setup DVB-T signal uses OFDM. 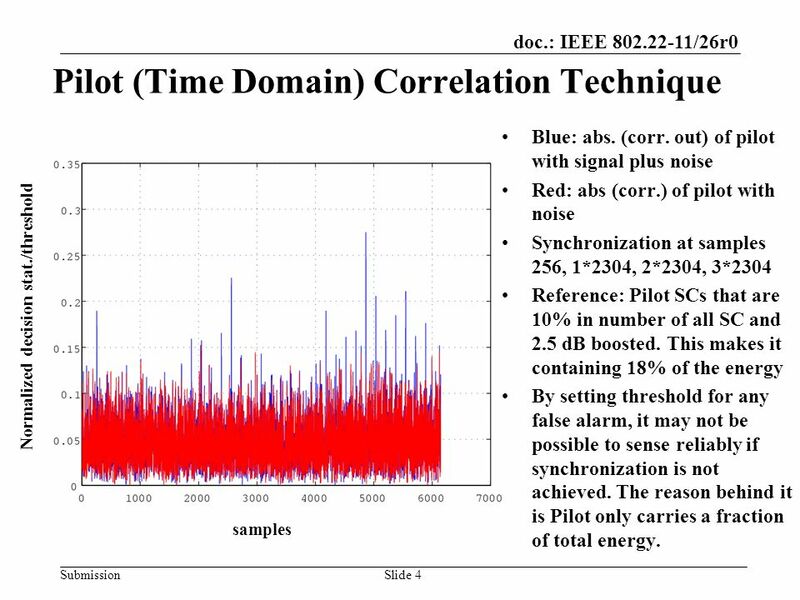 Here, simple OFDM signal is simulated –Random data sequence, Pilot in place as 2K mode of DVB-T –Pilot SCs that are 10% in number of all SC and 2.5 dB boosted. 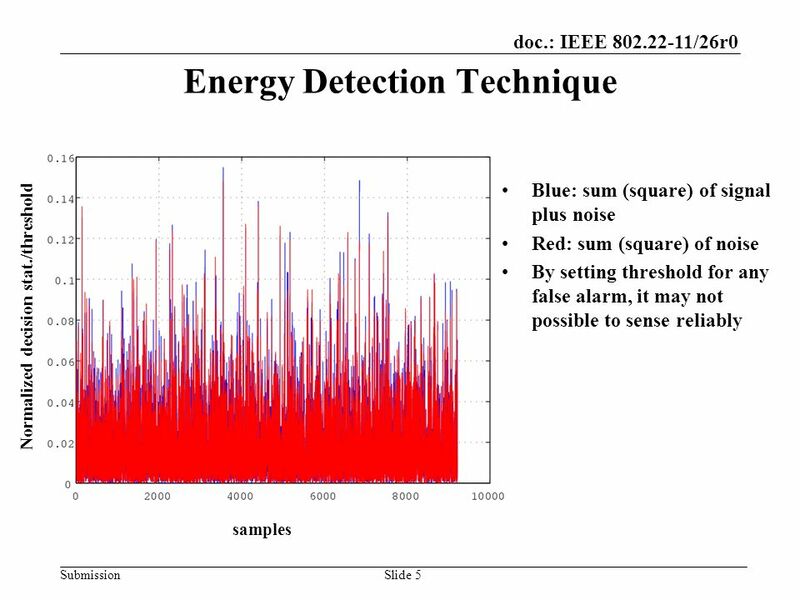 This makes it containing 15% of the total energy. SNR= -15 dB 2K FFT size, 1/8 CP Programs are given at the end Note: The results of 802.22-11-15r0 uses samples DVB-T data from signal generator. 10 doc. 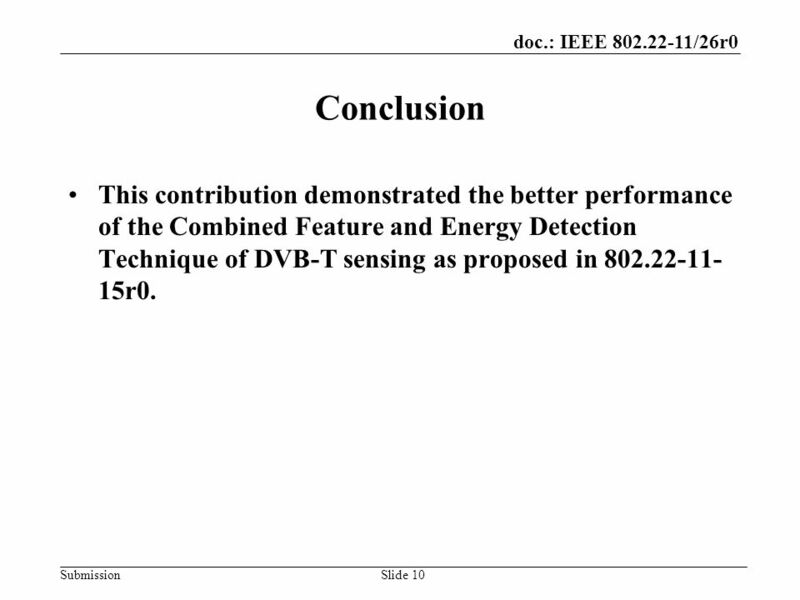 : IEEE 802.22-11/26r0 SubmissionSlide 10 Conclusion This contribution demonstrated the better performance of the Combined Feature and Energy Detection Technique of DVB-T sensing as proposed in 802.22-11- 15r0. Download ppt "Doc. 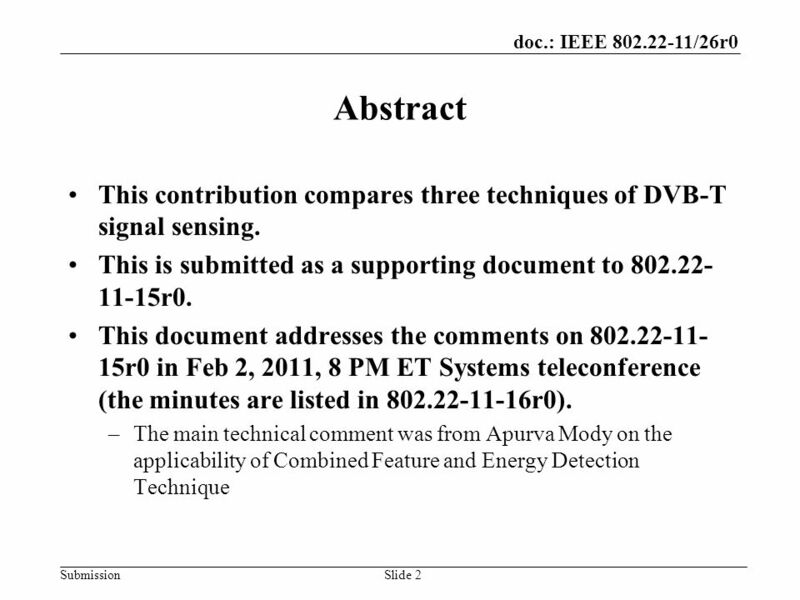 : IEEE 802.22-11/26r0 SubmissionSlide 1 Comparison of DVB-T Sensing Techniques IEEE P802.22 Wireless RANs Date: 2011-02-14 Authors: Notice: This document." Doc. : IEEE nan Submission September 2008 Phil BeecherSlide SG-NAN closing report for Waikoloa, HI, Sept 2008 Date: 11-sept-2008. Doc. 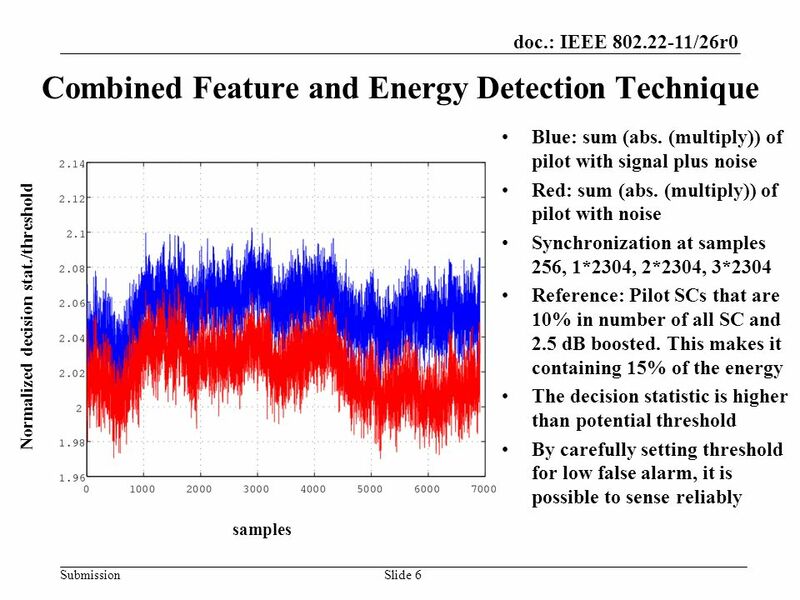 : IEEE /0200r0 Submission January 2007 Stephen McCann, Roke Manor ResearchSlide 1 TGu Closing Report Notice: This document has been prepared. Doc. 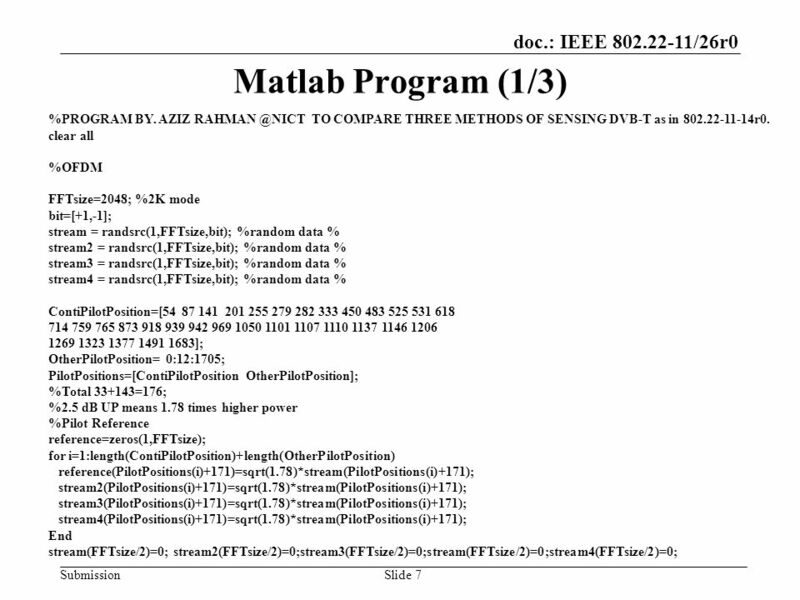 : IEEE /1116r0 Submission July 2006 Harry Worstell, AT&T.Slide 1 TGp Closing Report Notice: This document has been prepared to assist IEEE. Doc. 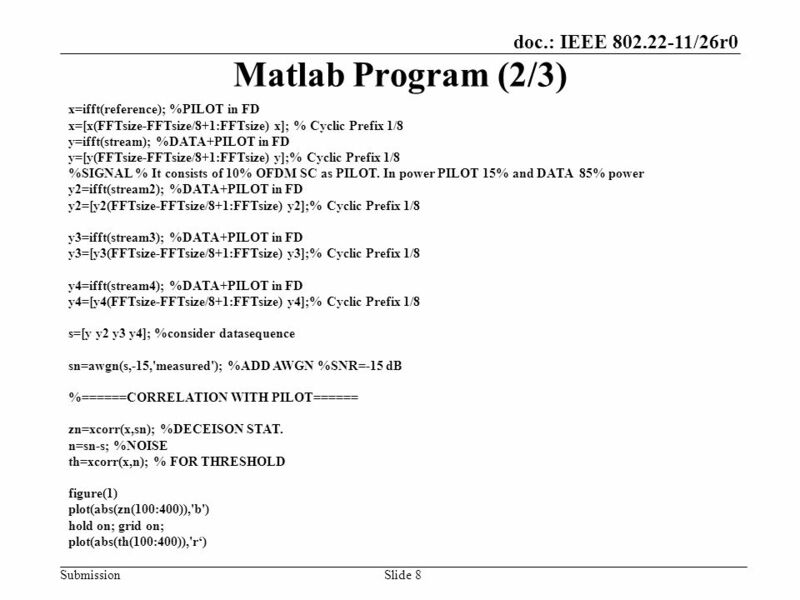 : IEEE /2163r0 Submission July 2007 Cam-Winget, Smith, WalkerSlide 1 A-MPDU Security Issues Notice: This document has been prepared to assist. Doc. : IEEE /0001r0 Submission January 2009 Steve Shellhammer, QualcommSlide 1 Writing a Coexistence Assurance Document Notice: This document has. Doc. 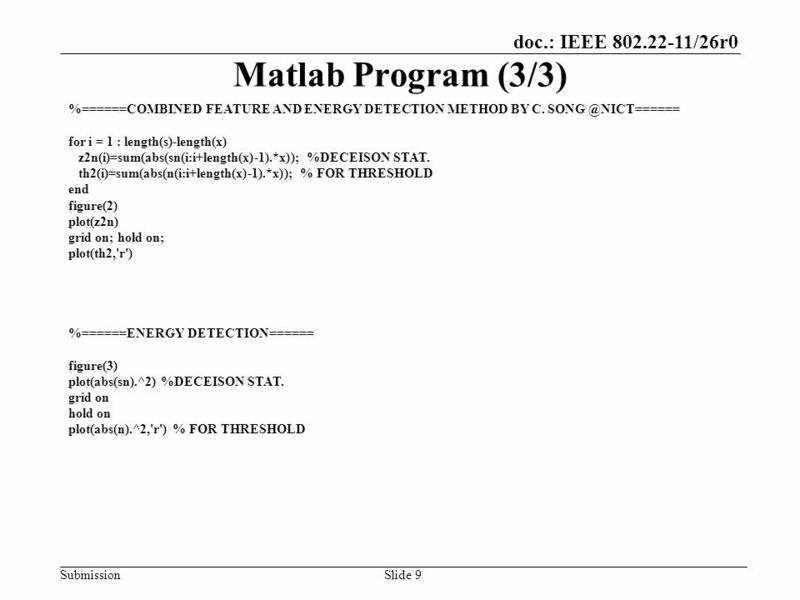 : IEEE /0026r0 Submission Dec Luke Qian, Doug Smith Cisco Systems, IncSlide 1 BA Reordering for A-MPDU Notice: This document has been. Doc. 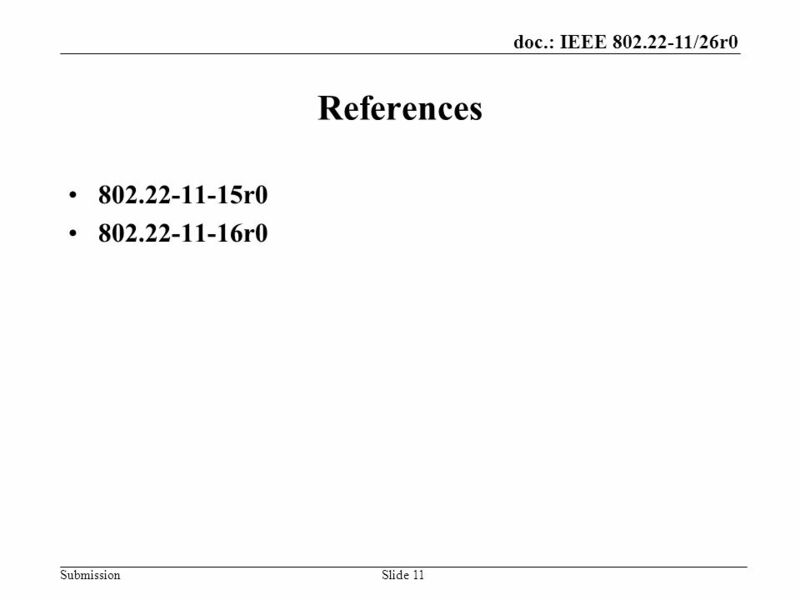 : IEEE 802.22-07/0022r0 Submission January 2007 Wu Yu-Chun, Huawei HisiSlide 1 Enhanced Beacon Sync Frame for the 802.22.1 IEEE P802.22 Wireless RANs.